Past the back alleys of Gotham, something is waiting. Deep in the darkness he smiles and laughs. Illustrator Hainanu 'Nooligan' Saulque found him, brought him to the deep chambers of DC Collectibles and gave him a form with a style unlike you've ever seen. THE JOKER is released upon the world. But he's not the only one. An army of some of the sickest artists in the industry has been summoned and they have answered the call. With each new wave of PVC statues comes a brand-new artist and an all-new style, building unreal interpretations of DC's iconic heroes and villains. This is DC like you've never imagined…but they have. Are you ready for DC Collectibles Artists Alley? From his distinct style of 1950's old school Americana, with a postmodern twist, comes artist Hainanu ' Nooligan' Saulque's unique take on one of DCs' most iconic villains. This version of The Joker is inspired by Hainanu's love of vintage newspaper strips creating a never before seen take on one of his favorite DC characters, classic shoes and all! 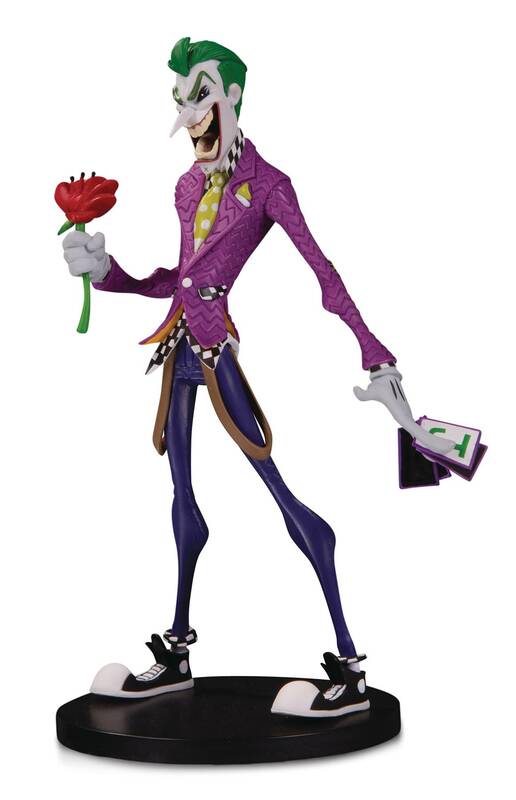 DC Artists Alley is a graphic and stylized PVC collector statue line from DC Collectibles based on designs from today's cutting edge artists. Channeling the popular comic convention experience, DC Artists Alley brings unique, artistic viewpoints to the DCU through highly-detailed, limited edition designer vinyl and includes a print featuring the original artwork the figure is based on..